We can make intentions, we can make plans, we can make duas, but we also need to have Allah’s “tawfeeq”: the key ingredient without which we cannot achieve anything in this life. As Prophet Shu’aib [alyhis] told his people: “And my [tawfeeq] success is not but through Allah. Upon him I have relied, and to Him I return” [Qur’an: Chapter 11, Verse 88]. Tawfeeq is the special acceptance and blessing of Allah with which He enables us to achieve our aims. It is His special help for the true believers who truly want to do something only for His pleasure. Contrary to the traditional way of thinking, Allah’s tawfeeq is not something which will hit you by chance; rather, it is something you “acquire” by making conscious efforts towards it. 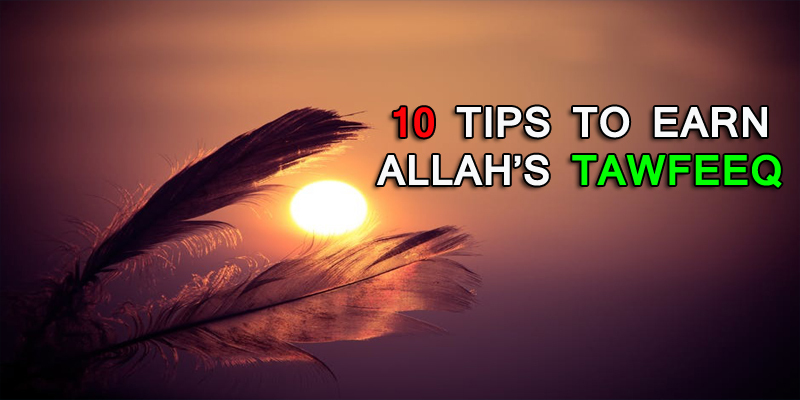 In this article, we will discuss some steps we can take to help us attain Allah’s tawfeeq, the key blessing which will open the doors of goodness and success for us, In sha Allah. The first and foremost thing to start with on this topic is to recognize that only Allah has the power to do everything. Of course He has given us the power to choose the right path and make efforts to walk on this path, but this doesn’t mean that we can accomplish things alone; we need His help all the time. You need to make the conscious decision and sincere intention to make Allah’s pleasure your main objective in life, and then prove this intention through sincere efforts. • Why am I doing this [any act that you embark on doing]? • Is this act of mine intended to please Allah?
. Is it for His sake or for something else? If Allah’s pleasure is our true goal, then surely we will not crave people’s praise and attention, and we will not be so worried about their criticism either. Ask Allah to give you the desire and determination to accomplish good deeds. Make dua a part of your life. Make dua while sitting, standing, walking, cooking, and cleaning. Basically, make dua all the time. Keep asking Allah to give you tawfeeq to do things which He loves and which are of benefit to others. Make the study of the Qur’an and hadith a part of your life, just like eating and drinking. In fact, the need for your heart to listen and absorb Allah’s words is far greater than the need of your body for food and drink. Our souls are starving while we are totally absorbed in feeding our bodies, so we must make efforts to balance this equation. As your heart will receive its nourishment (through studying and contemplating the Qur’an and hadith), it will become stronger and more able to absorb the guidance of Allah and be motivated to act on it, In sha Allah. Now this seems like working away from yourself, but in fact when you extend your efforts towards the benefit of other people, Allah’s mercy will shower upon you like rain, and the doors of goodness will open for you like never before. Therefore, being unconditionally open-hearted, generous and forgiving is one big secret to getting Allah’s special tawfeeq to do amazing good deeds. The more you give others, the more you will be given. • Does my heart carry any good feelings for others or am I usually self-centred? • Do I want others to succeed as well, or do I want Paradise only for myself? • When I have to share something with others -especially those whom I don’t like – do I think of it as an opportunity to win Allah’s pleasure, or do I think of it as a burden? • Am I good to people only because they are good to me? Or do I love them and care for them for the sake of Allah? Taqwa literally means to guard oneself against Allah’s displeasure. If we want to progress on the path of success, then it is absolutely essential that we live a conscious life and always be careful not to do things which might displease Allah. Some might think that doing acts of goodness will automatically guard them against committing sins. However, the truth is we need to make efforts in both directions simultaneously. We need to do good while exerting the necessary effort to avoid the evil. A very important thing to remember is not to fall into this trap: some people think that if they pray and read Qur’an then Allah will not be angry with them if they do a few sins here and there. This is a big mistake, and we must realize that no matter how pious we might appear to the world, Allah knows our reality. If we underestimate the sins we do in private, just because we might appear outwardly good to people, then we might not receive the tawfeeq of Allah to maintain the good deeds we’re doing and maintain our productivity. If someone really desires to be productive for the sake of Allah, then it is absolutely essential to spend time carefully and avoid all things that don’t bring any benefit. The useless activities discussed here could be the superficial pleasures that most of us are involved in these days, which seem to have absorbed our time and hearts so much that we think we can’t live without them. Can you identify those activities in your life? It is a matter of choice. You can either be productive and use all your time and intellect for doing something positive with your time which will bring you benefit in this world and the next, or you can waste this time in useless temporary pleasures. 8. Talk less, act more! One useless activity that has taken over many people’s time in our society is talking too much without specific purpose or direction. The fact is that if we don’t guard our speech, then we fall into the danger of indulging in backbiting, slandering, making fun of others or discussing others’ private matters, etc. Even if you can somehow guard yourself against all this evil, you still lose precious time which cannot be brought back at any price. This creates a barrier between you and the opportunities of earning Allah’s tawfeeq and doing good deeds. One big reason which keeps us behind in terms of good deeds is that when Allah gives us opportunities, sometimes, we don’t take them. Rather, we keep delaying things and think that we can do this or that later when it will be more convenient. This is because we have unrealistic hopes and we do not realize that our time is running out. 10. Get ready to work hard! We might have dreams to reach the top of the mountain, but what will actually take us there is constant hard work! Whoever wishes to win Allah’s pleasure and reach the higher levels of Paradise must be prepared to work hard. Most of us dream of doing amazing things for the sake of Allah but we don’t get up to turn them into a reality. Why? Because we don’t want to give up our comfort and pleasures, then we keep wondering why Allah is not listening to our duas. Allah gives tawfeeq to those who really mean what they say, those who struggle to please Him, those who work hard to find the way to do things which He loves. It is up to us to decide how much we truly want to succeed in this test of life. May Allah help us earn the true desire and determination to make the best out of our short life journey, so that we can attain the glorious endless success of the Hereafter, Ameen!